This morning my husband was the best motivator I could ask for. Although I wanted to stay in bed and not go to the gym, he forced me to get up and head to the Y with him. I begrudgingly obliged, and although I had a really tough run I am grateful that he made me go. Ryan and Sunny had made a deal earlier this week ... they would be allowed to drink every night of Sunny's visit only if there was working out involved as well. I agree with that rationale since life is all about balance. I am definitely not one of those people who indulge themselves without first making sure I put in my time at the gym. Although my determination wavers quite a bit, its good to know that I always find myself back at the gym working out. Sitting around with friends last night at Crave dessert bar, I mentioned that I planned on running in the morning and needed to go home. Everyone laughed and didn't believe me since we had all been drinking casually since earlier in the evening. I showed them all! I made it to the gym this morning with more enthusiasm than ever and busted out the most miles I've done in Charlotte to date. Wednesday - 1 minute walking warm up, 33 minutes 45 seconds running, 15 seconds cool down. I felt good and knew I could've run more if the treadmill would've let me. Silly YMCA regulations and their time restraints on the treadmills. After 35 minutes, the treadmill gives you a summary of your work out and instantly comes to a halt. Looking forward to warmer temperatures this weekend for some possible outdoor running. I've had a headache since I woke up this morning. I'm not big on taking medication unless absolutely necessary so I've avoided popping any pills, but at this point I'm miserable. I didn't let my headache get the best of me earlier today and somehow made it to the gym. Lucky for me I had Ryan scrapping all of the ice and snow off my car so I could actually drive it over to the YMCA. Between waking up a little sluggish and waiting for my car's de-icing, I didn't have as much time in the gym as usual. Tuesday - walked for 1 minute as warm up, ran for 22 minutes, walked for 1 minute as cool down. Although I ran less than last week, I was able to increase my pace. The weather in Charlotte should be warming up later this week so I'm hopeful that I'll be able to run outside. Fingers crossed! After a long hiatus ... I'm back! Belated Merry Christmas and Happy Holidays to all. Last week proved to be a really good running week for me. I was able to run 5 out of the 7 days and hit a little under 16 miles. Tuesday - I alternated between walking for 2 minutes and running for 8 minutes for a total of 32 minutes. Wednesday - I warmed up with walking for 2 minutes and then ran for 28 minutes, followed by a cool down of walking for 2 minutes. Thursday - I warmed up with the usual 2 minutes walking then ran for 29 minutes, followed by a 1 minute walking cool down. Saturday - Finally no treadmill! Ran with Ryan around St. Petersburg for 28 minutes. After traveling home yesterday from sunny Florida I was pretty worn out this morning when it was time to head to the gym. My body was saying "No running today," but my brain was all about those miles. Then I thought back to the large amount of snow that was covering my car and my lack of tools to fix that problem. I stayed in bed with Honey and will make up those miles this week. Thinking of running a half marathon in March ... thoughts? ... you drink too much wine during girls' night and aren't motivated the next day at the gym. Honey woke me up at 7am and after taking her out to do her business I figured I might as well head to the YMCA. Another really cold morning in Charlotte (20 degrees) meant wearing gloves while driving and keeping my hood up around my head the entire drive. Once at the gym I decided to stick with some cardio today. I cycled for 21 minutes and did 4.0 miles. Then I headed to the treadmill and set it on an incline of 0.5 and walked for 0.5 mile (7 minutes) then jogged for 0.5 mile (5 minutes). 33 minutes of exercise isn't bad for the morning after girls' night! Now I'm enjoying a nutritious green monster made with vanilla soy milk, a handful of spinach, a whole banana, and 2 ice cubes. It seemed as though I had skipped today for a work out since this morning my legs weren't feeling up to doing very much. After spending the whole day feeling sluggish I felt that I had to squeeze in a quick evening work out. Once I found out that girls night got pushed back 30 minutes I knew I had time for Jillian Michaels' 30 Day Shred. The work out includes full body exercises, ranging from bicep curls to squats. After each set of strength training you do cardio exercises (i.e.. jumping jacks) followed by ab work (bicycle crunches). I love that I was able to get a quick and hard full body work out in less than 30 minutes. Now it's time for girls night with Lori and Sue! On Monday morning I headed to the gym solo. Ryan has opted to do P90x at home and will only be joining me at the gym during cardiovascular days. Boo. I also ran for 2.52 miles on the treadmill (24 minutes). During the first 1.5 miles I had the treadmill on an incline of 0.5. On Tuesday I managed to pull myself out of bed and head out to the gym even though it was 17 degrees! Knowing that I would have to fill up my gas tank after my work out, I cut my time at the gym short and just ran on the treadmill. I increased my mileage to 2.75 miles and finished in 25:30 minutes. Today I woke up with sore legs and didn't really want to head out to the gym. Instead I did a load of laundry (work out clothes of course) and straightened up the house. I made a couple of green monsters for myself and Ryan as breakfast #1 and then made us eggs and bacon for breakfast #2. Sadly our food stash has been dwindling and each of us had 1 egg and 1 strip of bacon. Very meager portions for such big eaters. 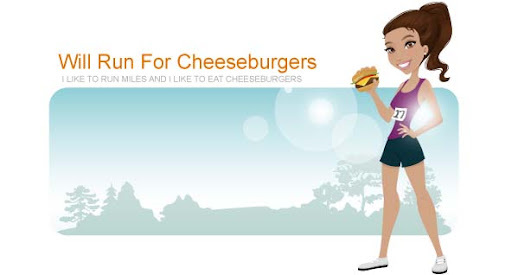 Big news in my blogging world is that I finally bought www.willrunforcheeseburgers.com. I have not done much with it yet but knowing that I own a website makes me giddy. Further details on the progress of my site to come later. There's something about working out in the morning that leaves you feeling so energized. Today was my 5th day in a row of working out. Hopefully I can continue this throughout the month even when the temperature gets down to the low 20's and the last thing I want to do is head outside. I'm looking forward to get a night with friends to celebrate Brandon's birthday, followed by more fun this weekend. It's one of those days where I'll be staring at the clock in anticipation! This was my 4th day of working out in a row! Big accomplishment for someone who has not been feeling all that motivated the past couple of weeks (me). I did 3 sets of biceps exercises, followed by 2.03 miles on the treadmill (20 minutes), then finished off my work out with 125 crunches. I'm so happy that I didn't wait around to do my running outdoors ... it was another cold day in Charlotte. I need to buy some more warm weather running clothes ... especially some ear muffs! It was my own fault for sleeping in yesterday and not getting up to go to the gym. By the time Ryan and I were ready to work out it was past 5 p.m. and the sun had already set. Instead of rushing to the gym during the busiest time there, we decided to bundle ourselves up and head outside for a run. Boy was it cold! The winds were strong and the temperature was low. We barely finished our 1.1 miles around our neighborhood before we rushed back to our warm apartment. December 1st marked the first day of my return to running after over a week off. Should be a good month to get some mileage in (indoors that is).